Jesus Christ is the most controversial figure to ever live. Two thousand years ago crowds cried out for His crucifixion while multitudes hailed Him as King. Many claimed He broke the law, others say He fulfilled it. Some called Him a criminal and others call Him Savior. Some say He was a hoax and others claim He is the way, the truth, and the life. Some say He died thousands of years ago while others say He is risen from the dead. Still today, no other name is more offensive; no other name is more praised. The question that we’ll be asking at Easter is: Criminal or King? Step one of Next Steps: 20 minute intro to Vizion, takes place on the first Sunday of each month directly following both services. Step two of Next Steps: We want to get to know you! One on one with a Next Steps Team member will be scheduled, so we can find the best place for you to get plugged in at Vizion. Whether you are new to Vizion or if you’ve been attending for years, take this step to learn how to surround yourself with a healthy community at Vizion! If you have accepted Jesus as Lord and Savior of your life, it’s time to take this step! Whether it has been several years or a couple of weeks, we encourage you to pray through this decision and take this leap of faith! 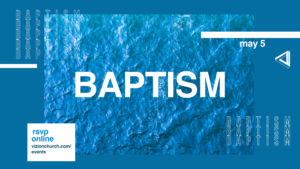 If you have any questions about baptism, feel free to email info@vizionchurch.com. What to expect the day of: We provide T-shirts for all who get baptized. Where dark clothes, and bring a change of clothes along with a towel…you will get wet! School of Discipleship is a five week class unpacking 15 foundational elements of Christianity. This class is for everyone, whether you are a new believer or have been a believer for years. We hope you will join us as we believe this will be transformational in your walk with the Lord. Registration is $50 per person (scholarships are available) and childcare will be provided by Vizion Kids.